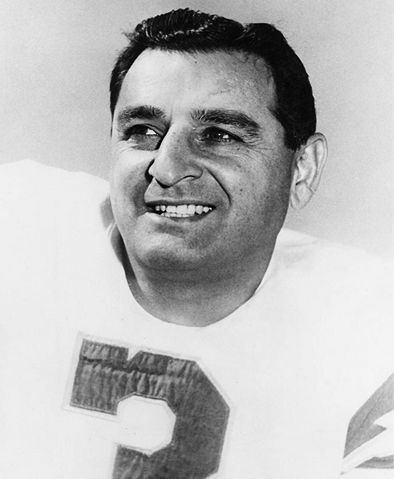 Born to Armenian immigrants in Santa Ana, Calif., Agajanian played football in high school and for New Mexico in 1940 and ’41, said The New York Times. He made his NFL debut in 1945, playing briefly for the Philadelphia Eagles before joining the Pittsburgh Steelers, where he was a defensive end until he broke an arm. “He then kicked while wearing a sling.” Agajanian’s teams touted him as “Bootin’ Ben the Toeless Wonder,” said the Los Angeles Times. He wasn’t a very accurate kicker by today’s standards, making about 51 percent of his field goals over his career. But he was good enough to lead the league in 1947 and 1949, and helped the Giants win the 1956 NFL Championship Game, kicking two field goals.